Cebu Pacific to conduct an investigation on alleged theft by flight steward - Balita Boss! Cebu Pacific issued a statement saying that the company is already conducting an investigation about flight steward who allegedly stole money from passengers in a China-bound flight. "CEB has been made aware of an alleged incident of theft in one of our charter flights to China. CEB is conducting a thorough investigation in parallel with an independent, third-party investigating body on this alleged incident. As part of standard procedure, cabin crew members of the said flight will be placed on paid leave and a non-flying status, pending the completion of the investigation. CEB will take the appropriate action, depending on the result of the investigation." A report of the incident, taken from a China-based daily and circulated Thursday on the social networking site Facebook and on Twitter, said that the August 11 flight from the Kalibo International Airport had just landed at the Changsha Huanghua International Airport in China when the theft was discovered. Three passengers reportedly found out that they lost cash, amounting to 8,000 Yuan or Php 56,000, from their baggage and sought the help of local authorities. The immediate response of the police resulted in the recovery of some of the missing money from inside the aircraft. Continue reading on Inquirer.net. Below is the post of Henry Wong in Facebook of alleged thief. This was a male flight attendant of Cebu Pacific Air Flight 5J52 from Boracay to Mainland China early this week. He allegedly stole the money of several passengers on board and was was caught red handed by the passengers. 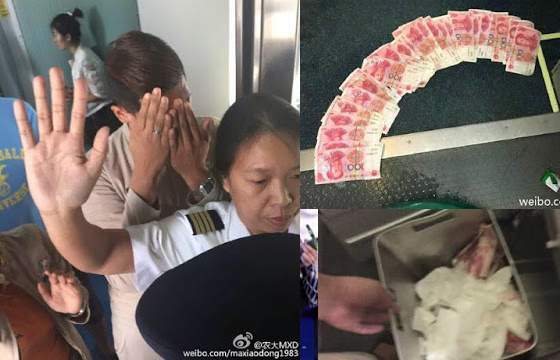 Although he was able to flush dozens of pieces of RMB¥100 bills down the toilet, airport policemen were still able to recover damp RMB bills from the garbage bin in the lavatory. The whole crew were said to have conspired to committing the crime because other flight attendants and the air marshall were covering the suspect when he rushed to the toilet trying to destroy all evidences. The crew started to look suspicious when they insisted that the window shields must be pulled down all the time and even small sling bags were required to be stored in overhead bin while much bigger school bags of children were exempted. The handwritten Chinese letter was the testimony of the passengers.